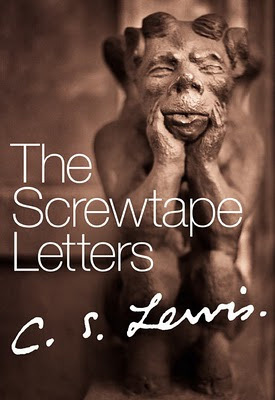 I just finished re-reading The Screwtape Letters, and I love how some books only get better with each reading. Our pastor used this text as well as the current New York Times bestseller, Heaven Is For Real by Todd Burpo (that I reviewed earlier in the year) as the basis for a four part series “Distracted from Heaven.” It has been at least ten years since I’ve picked up C.S. Lewis’ Christian satire, so I figured it was due another read. The Screwtape Letters is a epistolary novel, a series of letters from a senior demon, Screwtape, to his nephew and a younger demon in training, Wormwood. Screwtape is coaching his young nephew on the art of temptation and how to lure Wormwood’s “assignment” – a new Christian young man – away from his new found religion and back into the ways of the world. By using satire, Lewis is able to enlighten Christians to the subtle ways we are often led astray. The key tool is distraction – not the myriad of blatant sins one often thinks of as worldly living. “[T]he only thing that matters is the extent to which you separate the man from the Enemy… Murder is no better than cards if cards can do the trick. The safest path to hell is the gradual one,” Screwtape chastens. Regarding the war, the demons largest hope is that the subject will latch onto either patriotism or pacifism – it doesn’t matter which one. Then let him, under the influence of partisan spirit, come to regard it as the most important part. Then quietly and gradually nurse him on to the stage at which the religion becomes merely part of the “cause”, in which Christianity is valued chiefly because of the excellent arguments it can produce [his] favour… Once you have made the World an end, and faith a means, you have almost won your man, and it makes very little difference what kind of worldly end he is pursuing. It was passages like this that made me stop and think about how much time and effort we spend defending our ‘labels’ – whatever they are – and what they are doesn’t really matter in the eternal scheme. What matters is if and how we allow them to divide us from the things that do matter – relationships, service, worship. For the Present is the point at which time touches eternity. Of the present moment, and of it only, humans have an experience analogous to the experience which our Enemy has of reality as a whole; in it alone freedom and actuality are offered them. He would therefore have them continually concerned either with eternity (which means being concerned with Him) or with the Present—either meditating on their eternal union with, or separation from, Himself, or else obeying the present voice of conscience, bearing the present cross, receiving the present grace, giving thanks for the present pleasure. And so in this particular reading of The Screwtape Letters, I’ve been reminded to live in the present – to take stock of the things that count and the things that may be present in my life that serve more to divide relationships than to build them. If you’ve never read The Screwtape Letters, it is a classic worth picking up. And, if you’re interested in the series Kevin Myers taught, “Distracted from Heaven,” you can listen to all four messages here. The series started 8/7/11 at the Lawrenceville location. I agree that this is a book that gets better with each reading. I think C.S. Lewis has a gift for pointing out the ordinary little things in life that can be far more damaging than the big trials.